SFA’s team worked with Easton Area School District to renovate and expand the existing middle school to more than three times its original size. The expansion harmonizes with the existing architecture, and together, the school building houses more than 3,000 students in grades 5-8. Easton Area School District selected Spillman Farmer Architects to design its new middle school campus to accommodate current needs and the projected population growth. The project focused on the substantial expansion of the existing middle school from 174,000 SF to 549,000 SF to house the education of more than 3,000 students in grades 5 through 8. 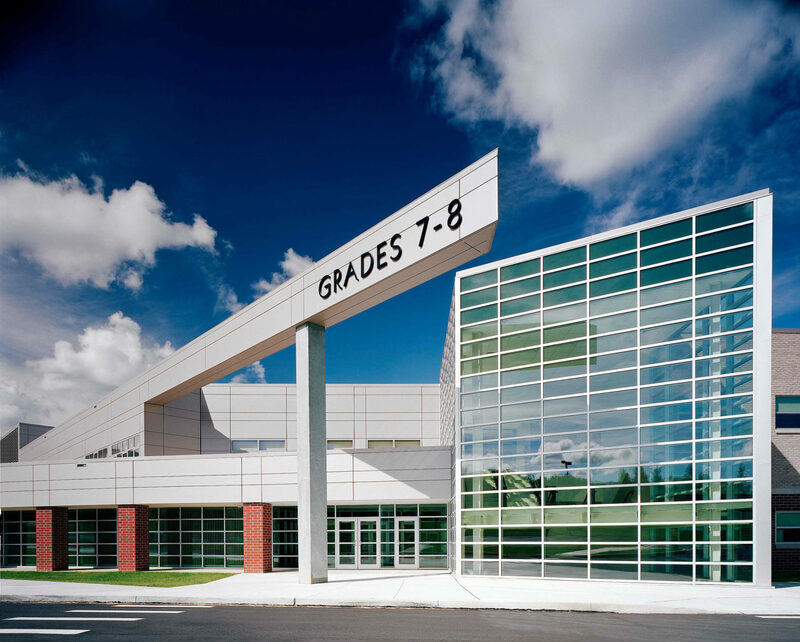 The overall campus was envisioned as “schools within a school.” The existing building was renovated for the fifth and sixth grades while the new addition was designed to meet the needs of grades seven and eight. Each school has its own entrance, administrative area, library, nurse, computer labs, music rooms, faculty areas, student dining areas, and physical education spaces. They share a new 1750-seat auditorium, a 3,000-seat performance gymnasium, television studio, and kitchen facilities. These areas have been strategically planned to allow for classroom areas to be secured when public spaces, such as the auditorium or performance gym, are used for evening events. A “light court” brings natural daylight into nearly every classroom. The exterior of the new addition harmonizes with the existing building while reducing the apparent mass of the substantial structure. The south façade curves gently to contour and reduces the visual length of the building by eliminating abrupt corners. Three main glass-walled stair towers are a cost-effective design element that also allows for ease of circulation and increases security. During evening events, the glass entrances and stair towers act as a beacon, drawing visitors into the school.